Just how much does California State University - East Bay cost for tuition now, and how much is tuition estimated to change? How do these charges compare to other schools? Keep reading to find out. Plan money wise for your degree. Compare California State University - East Bay's fees and tuition to other American colleges and universities. Check for tuition tendencies and potential increases to find out whether you should budget for more funds for the next four years of paying for college. How Does California State University - East Bay Contrast With Other Schools? The subsequent table outlines how California State University - East Bay measures up to other schools nationally, regionally and by state. California State University - East Bay fees and tuition is lowered dramatically for students from California. For in-state students, tuition and fees is set at $6,834 for the 2017 - 2018 year, 63.5% off the price charged to out-of-state students. Tuition is $5,742 and fees $1,092. California State University - East Bay out-of-state undergrads paid $18,714 in tuition and fees in 2017 - 2018. $1,092 was fees, and $17,622 was charged for tuition. For more information, check out California State University - East Bay Part Time Tuition & Fees. California State University - East Bay tuition and fees have not changed substantially in the last five years. We estimate the cost of tuition and fees for this year will total $18,714. If prices continue to remain stable, two years at this school will run you $37,428 and four years will run you $74,856. Furthermore, you will probably have additional costs for room and board, books and, transportation. 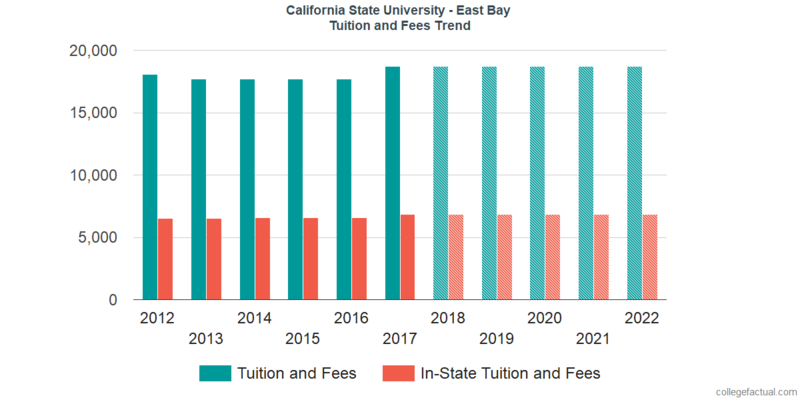 The next chart displays projected future tuition and fees which includes residence based discounts for undergraduate students at California State University - East Bay. At a lot of schools you'll end up paying out more for your last year of college than you will in your first. This is because of yearly price increases. It's good to be aware! Uncover answers to your finance problems in the tuition & fees FAQ.